If you are from Houston, you know what the most famous day is in June. I gar-RON-TEE this song is mentioned, quoted, and body rocked to in the comments section. DJ Screw and the SUC with their 40 min freestyle managed to add a random day in June in the lexicon of hip-hop. June 27th has crossed racial, social, and economic barriers and thanks to Drake, it has been reintroduced to a generation that may have begun to let its impact drift from its memory. This song isn’t as celebrated as Juneteenth, but it may be better known. If we took a poll of people under the age of 30 and asked the significance of Juneteenth, the results might surprise you. Heck, some of you reading this don’t know the historical significance of Juneteenth. To be honest, knowledge about this historical day in Black History and folklore is predicated more so on one’s geography than their general knowledge. For those that don’t know what Juneteenth is, let me take a brief moment to explain. 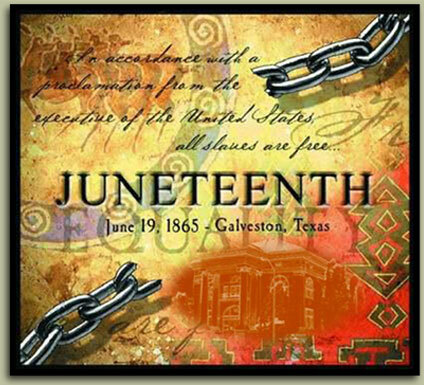 Juneteenth is Black Independence Day, technically known as Emancipation Day. It is the day the Emancipation Proclamation (EP), given by President Abraham Lincoln, was enforced in Texas. It should be noted; this enforcement took place nearly 2 years after the Emancipation Proclamation went into effect. While America celebrated July 4th to mark their freedom from big bad British rule, black people were still enslaved until the Civil War (Not that that stops us from firing up the pit on 7/4). So this Juneteenth stuff is, or at least should be, a pretty big deal. However, I had never heard of it until I moved to Texas. I’m certain that they celebrate in the Go now and possibly then, but it certainly wasn’t as big of who-rah as it was in the great state of Texas. In Texas, there are Miss Juneteenth Pageants (s/o to Mrs. Nichols-Clark), parades, programs, reenactments, and BBQ’s all over the state. 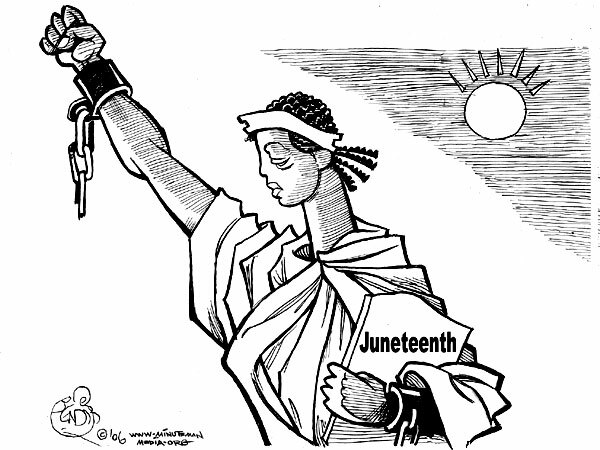 Juneteenth is now celebrated all over the south and east coast. It has become a staple for the bougie, the ratchet, and all points in between. Juneteenth is also apart of Black Folklore. There are several versions of why it took word of the Emancipation Proclamation (EP) 3 years to get to slaves in the south. There are stories of slave masters conspiring to stop the news from getting to slaves in a collaborative effort to maintain their status and income. Other stories telling of the murder of a THE MESSENGER, sent to tell the largest plantation in Texas about the EP, with his message bag, holding the official decree, held hostage by rogue confederate soldiers as blackmail to plantation owners. There are even theories that federal soldiers were given orders to take their time getting to the major plantations in Texas so that there would be one more cotton crop harvested before slavery was finally dissolved. Though none of these stories can be confirmed, they offer a glimpse into the oral history of Black people and how these legends have forged through 148 years of whispers from grandparent to grandchild. It is important that this recent resurgence in the celebration of Juneteenth maintain its momentum. That we continue to post on FB, Twitter, and possibly have real face-to-face conversations about it. Our communities are in a constant need of reminding of our triumphs. We face trials everyday, from injustice in the criminal system to shackles on sneakers. On days like today, it’s good form to celebrate our victories, whisper our history into the ears of the next generation (and the current generation), and fire up the pit. What will you do today to celebrate Juneteenth? Have you ever participated in an official Juneteenth celebration like a pageant or play? How was it? Do you think it’s important to still celebrate events like Juneteenth? How can you hear June 27th and not bob ya head little bit? ← How an Empty Tic Tac Container Changed My Life?